We analyze the enrollment data of US colleges, 2012. We analyze public college tuition rates for over the past 10 years (2003 - 2012). 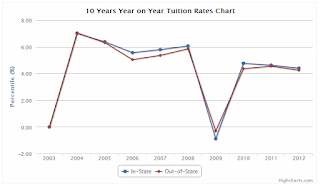 We provide tuition change graph, year on year tuition rate comparison chart, and 10 year cumulative tuition chart. Public school offers in-state tuition to the state residents and ,as widely known, public school tuition is lower than private school even comparing its out-of-state tuition. You can check the increased amount of tuition cost, change percentile by year-on-year and cumulative tuition rates. In Ivy League, there are 8 members - Brown University, Columbia University in the City of New York, Cornell University, Dartmouth College, Harvard University, Princeton University, University of Pennsylvania, Yale University. All members in Ivy League are private schools. In 2017, the average tuition & fees in Ivy League is $44,957 which is risen by 3.96% from last academic year. The average cumulative tuition increase rate of Ivy League schools is 26.38% from 2010. Columbia University in the City of New York has the highest amount of tuition & fees of $55,056 in 2017. Princeton University has the most tuition & fees increase of 4.26 % this year and over the current decade, Yale University has risen most in tuition & fees by 29.19%. Next table and charts illustrates the tuition changes from 2010 to 2017 for Ivy League schools and universities. The costs officially published by IPEDS, U.S. Department of Education. Next table illustrates the changes of graduate school tuition & fees for Ivy League schools from 2010 to current year. You can estimate future years tuition based on year-by-year increase rates and/or cumulative rates. It is good to compare schools in Ivy League in perspective of admission, graduation, and scores as well as overall college costs at Ivy League Academic Key Facts Comparison. California Institute of Technology is a Private (not-for-profit), 4 or more years school located in Pasadena, California. Its 2017 tuition & fees are $47,577. The tuition has risen by 4.82% from last year and has risen by 31.13% over the current decade (the 2010s) cumulatively. Below charts and tables illustrate the college costs changes at California Institute of Technology including tuition, fees, living costs, and costs for books/supplies. You can check more information about California Institute of Technology including admission, graduation, population, and other statistics at schools's full information page. In addition, you can request admission, tuition, and other recent information of California Institute of Technology. Next table and charts illustrates the tuition changes from 2010 to 2017 for California Institute of Technology. The statistics and analysis are based on costs data that are officially published by IPEDS, U.S. Department of Education. The 2017 undergraduate tuition & fees are $47,577 which has increased by 31.13% over the current decade. In average, the year-by-year rate of increase in tuition & fees is 4.45% while last year increase rate was 4.82%. The 2017 graduate school tuition & fees are $47,451 which has increased by 31.32% over the current decade. In average, the year-by-year rate of increase in graduate tuition & fees is 4.47% while last year increase rate was 4.54%. In this page, we introduce colleges which is members of Southeastern Conference (SEC) major program and compare tuition costs between them for year 2015. The Southeastern Conference (SEC) is a collegiate athletic conference whose member institutions are located primarily in the southeastern part of the United States. It is headquartered in Birmingham, Alabama. The SEC participates in the National Collegiate Athletic Association (NCAA) Division I in athletic competitions; for football, it is part of the Football Bowl Subdivision (FBS), formerly known as Division I-A. The conference is one of the most successful financially, consistently leading most conferences in revenue distribution to its members, including an SEC record $220.0 million for the 2010-11 fiscal year. In Southeastern Conference (SEC), 13 public and 1 private schools are in Southeastern Conference (SEC). Next table shows academic information and general characteristics of the Southeastern Conference (SEC) members. Below section describes the tuition and other costs for each Southeastern Conference (SEC) school. 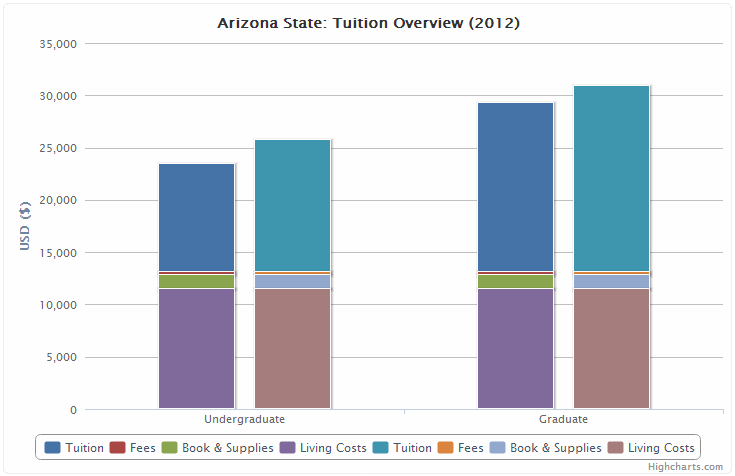 You can analyze and compare 2015 tuition cost between them with tables and charts. In addition you can compare the schools in all academic perspectives including admission, tuition, graduation, population and more at Southeastern Conference (SEC) tuition comparing page. The average undergraduate school tuition & fees for the Southeastern Conference (SEC) colleges is $ 9,276 for in-state students and $ 26,563 for out-of-state students. The average graduate school tuition & fees for the Southeastern Conference (SEC) colleges is $ 8,616 for in-state students and $ 23,996 for out-of-state students. The average living costs for the Southeastern Conference (SEC) colleges is $ 14,250 when living on campus and $ 14,530 when living off campus. Tuition and fees - Revenues from all tuition and fees assessed against students (net of refunds and discounts and allowances) for educational purposes. If tuition or fees are remitted to the state as an offset to the state appropriation, the total of such tuition or fees are deducted from the total state appropriation and added to the total for tuition and fees. State appropriations are amounts received by the institution through acts of a state legislative body, except grants and contracts and capital appropriations. Funds reported in this category are for meeting current operating expenses, not for specific projects or programs. Government grants and contracts - Revenues from governmental agencies that are for specific research projects, other types of programs , or for general institutional operations (if not government appropriations). Examples are research projects, training programs, student financial assistance, and similar activities for which amounts are received or expenses are reimbursable under the terms of a grant or contract, including amounts to cover both direct and indirect expenses. Includes Pell Grants and reimbursement for costs of administering federal financial aid programs. Grants and contracts should be classified to identify the governmental level - federal, state, or local - funding the grant or contract to the institution; grants and contracts from other sources are classified as nongovernmental grants and contracts. GASB institutions are required to classify in financial reports such grants and contracts as either operating or nonoperating. Nonoperating - GASB requires that revenues and expenses be separated between operating and nonoperating. Operating revenues and expenses result from providing goods and services. Nonoperating activities are those outside the activities that are part of the operating activities of the institution. Most government appropriations are nonoperating because they are not generated by the operations of the institution. Investment income is nonoperating in most instances because institutions are not engaged in investing as an operating activity. Gifts are defined as nonoperating. Nonexchange transactions generate nonoperating revenues. Private operating grants and contracts - Revenues from nongovernmental agencies and organizations that are for specific research projects or other types of programs and that are classified as operating revenues. Examples are research projects and similar activities for which amounts are received or expenditures are reimbursable under the terms of a grant or contract. Gifts, including contributions from affiliated organizations - Revenues from private donors for which no legal consideration is provided; these would be nonexchange transactions as defined in GASB Statement No. 33 Accounting and Financial Reporting for Nonexchange Transactions. Includes all gifts or contributions to the institution except those classified as additions to permanent endowments or capital grants & gifts. Includes gifts from affiliated organizations. Includes the amount of contributed services recognized by the institution. Amounts from capital grants and contracts are not included. Investment Return - Revenues derived from the institution's investments, including investments of endowment funds. 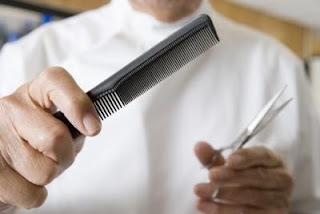 Such income may take the form of interest income, dividend income, rental income or royalty income and includes both realized and unrealized gains and losses. 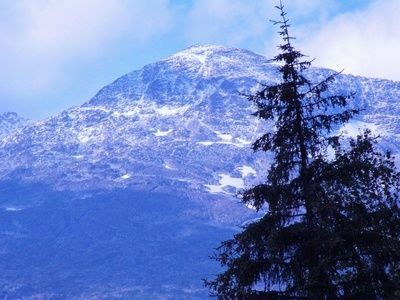 There are 12 colleges and Universities in Alaska State - 7 Public and 5 private schools. 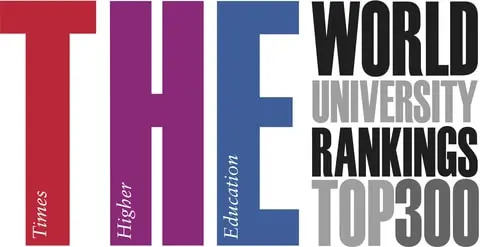 12 schools have certificate programs, 10 schools offer Associate Degree, 7 schools for Bachelor Degree, 5 schools for Master Degree, and 2 schools have doctorate program. Undergraduate school average tuition of Alaska colleges is $8,997 for in-state and $12,991 for out-of-state student. Average tuition of graduate school is $9,531 (in-sate) and $16,515 (out-of-state). 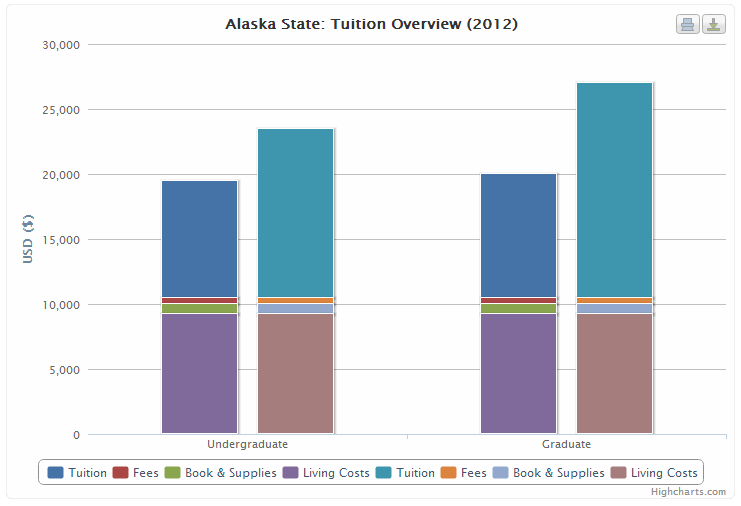 Next Table shows the 2012 Alaska Tuition summary. And graphical chart for Alaska 2012 Tuition is here. 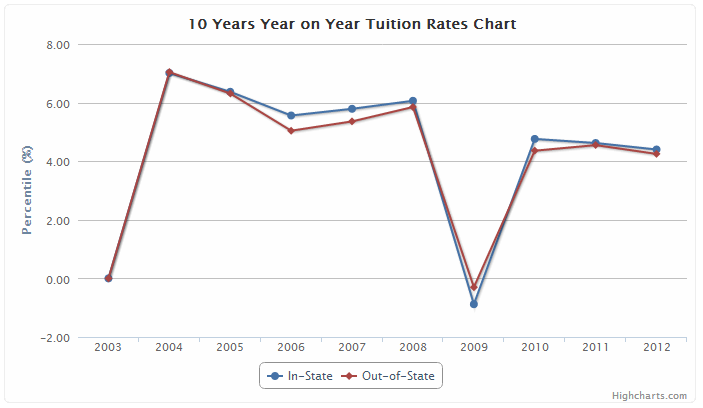 You can see more graph and table for 2012 Alaska State Tuition and Financial aid information. In addition, Summary Table for Alaska State Tuition and Financial aid is provided here.